The Last(?) Garage Giveaway, Roger Wagner Keynote and more! Recently, our intrepid Paleotronic explorers flew to Vancouver and then ventured by minivan deep into the heart of America. We picked up a few fellow travellers along the way, and eventually, after journeying through the mountains of Utah, valleys of Colorado and the plains of Kansas we reached Kansas City and the mecca of Steve Wozniak’s masterpiece – the Apple II – KansasFest! 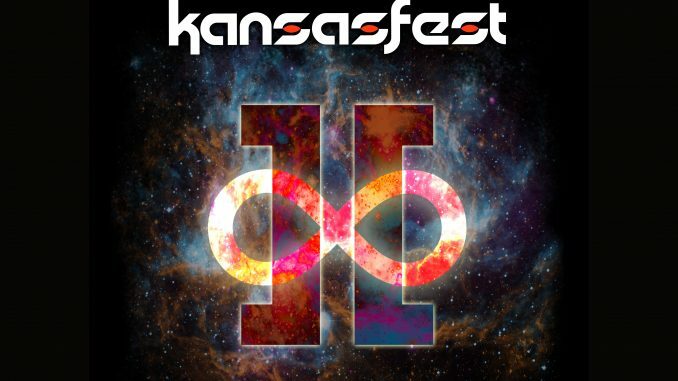 KansasFest is a long-running five-day retrocomputing convention where (most) attendees stay together in the dormitories of KC college Rockhurst University. From early in the morning until late at night there is much discussion about all things Wozniakian. You do nothing but eat, sleep and drink think Apple II! It’s been described as “summer camp for nerds”. 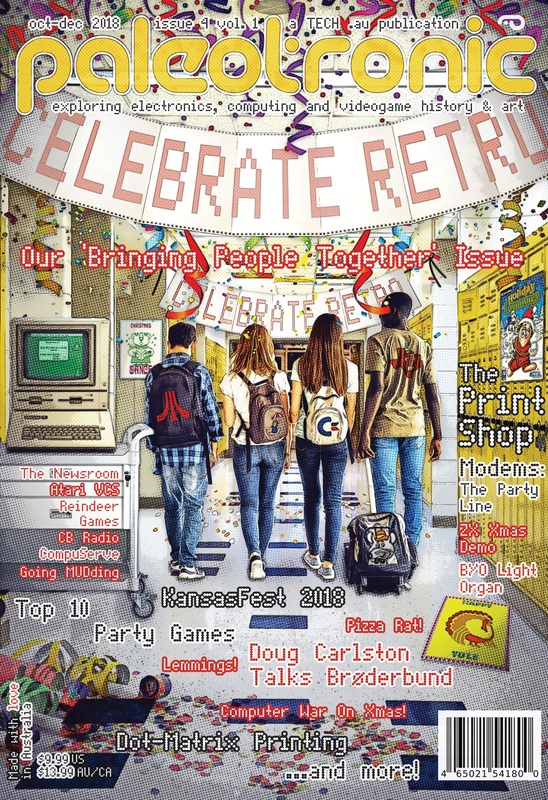 This year was the 30th KansasFest, a significant milestone – the event has been going since the Apple II wasn’t retro! We arrived late on the Tuesday night, and official proceedings began the next morning, starting with the (last? Maybe not…) Garage Giveaway, a KansasFest tradition where a large variety of Apple II (and other 8-bit computer)-related hardware and software collected by volunteers throughout the previous year (and other items donated by attendees) are put out in the front hall of the dormitory, where at the appointed time attendees can pick and choose and take what they desire. While the selection was not perhaps as broad as previous years there was still a great many items for the 100+ attendees to look through, and we’re sure most everyone found something of interest. For example, your editor claimed a large number of Call-A.P.P.L.E. and other vintage magazines useful to her cause. Then, after a feast of greasy meat (it _is_ Kansas City after all), we all sat down for the keynote presentation by Roger Wagner. Roger Wagner’s books were pivotal in educating an entire generation of computer programmers in 6502 assembly language, but his most successful product was a software program that still helps K-12 students with their school projects. He got his start teaching high-school chemistry classes in a boarding school that was a converted barracks, initially engaging his students with model rocketry, but then he heard about the then-emerging home computer industry. “If you’re going to be a mad scientist launching rockets from eighth-grade classrooms, you’re going to need a computer,” Wagner said of his thinking at the time. He initially planned to buy a Commodore PET, but when he went into the computer store the demonstration PET was offsite and there was only an Apple II, which was much more expensive. He hatched a plan to masquerade as a dealer to get a discount, and he called a distributor. Things seemed to be going well until the distributor wanted to see his store! He fessed up, and the distributor offered to give him a machine at wholesale cost if he could sign up another (real) store. And so he became an impromptu computer salesman, walking around San Diego attempting to convince stores to carry the Apple II. Eventually, Roger found himself at an Exidy Sorcerer store in Oklahoma, which agreed to carry the computers, and Roger finally got his Apple II. But other stores had wanted proof the computer was actually useful and so he started to see what he could do with the Apple II, for the purposes of demonstration. He started writing programs, searching for ways to push the limits of the computer. He published a few articles in magazines such as Call-A.P.P.L.E., Nibble and inCider, and then decided to sell those programs on tape, such as an assembly language routine that renumbered BASIC programs. It was initially BASIC itself, but it was too slow and so he had to learn assembly language programming to get it done faster. Roger wrote as he learned, developing a library of software. Eventually, the columns were compiled into a book by Softalk’s publisher and Roger finally started to see some money for his work. And so, he decided to become a publisher himself, advertising for people to send in their code. He was impressed by some of the submissions, and he wrote a number of utilities to make programming much easier. He used a number of his own routines to create applications such as word processor. Time went on and then Roger learns Apple is going to have a promotion where they’ll put vendors’ coupons in their computer boxes for Christmas. So he has another entrepreneurial idea (just one of many), starting a magazine targeted toward children called The Apple’s Apprentice – but it only lasted for three issues (because producing glossy colour magazines is expensive, don’t we know it!) While each issue was full of useful information, Roger’s editorial style was full of tongue-in-cheek humour which may have not played well with parents! These three magazines have been reprinted in a compilation which is available from Call-A.P.P.L.E. He then released a game that had no instructions and in which all text was written in a made-up “alien” language, called Bezare. Anyone who decoded the game was eligible to enter a draw for an Apple II. However, as Roger puts it, “There was a flaw in my marketing plan.” Even naming the game would give players clues about how to decode the language, and so advertisements were all in the alien language! However, on a hang-gliding trip in Mexico, Roger had the idea to put a special key into Bezare that displayed a fake spreadsheet when pressed so users could play it at work, a feature that would come to be known as the “boss key”. Roger’s business grew and he changed its name to Roger Wagner Publishing. He hired lots of people and spent every dime he had attempting to expand the company, but he neglected his bills and unfortunately, the IRS turned up and threatened to auction off all of his IP. He had two weeks to come up with what he owed in taxes. But luckily he was saved by a guardian angel who bailed him out. He went back to basics, just working by himself. One day, a fellow walks into Roger’s office named Dave Klimas, who was interested in developing a hardware project. Roger looked into his “book of ideas”, and remembered he had wanted to build a digitiser card for the Apple IIGS – but it needed to cost less then US$5 to produce to be commercially viable. Dave was successful, and then Roger began searching for applications for the card. One idea was a circus game where children could command the animals, but that was very niche. Eventually Roger hit on the idea of creating a IIGS clone of Hypercard, a Macintosh multimedia scripting application. By bundling a library of clip-art and the sampler, children could quickly develop multimedia presentations. He called it HyperStudio (mimicry is the best form of flattery!) and showed it around trade shows, where it began to garner considerable interest. Schools uninterested in upgrading to the Macintosh looked to HyperStudio to give them similar functionality, and the application was quite successful. Roger went to KansasFest in 1994 and 1995 (and maybe some other years), wore loud ties and inspired the Crazy Tie Contest, and something called “Bite the Bag” the details of which we won’t go into here. He was inspired to start another event based around HyperStudio he called HyperFest. Unfortunately, success once again went to Roger’s head. He sponsored racing cars (because racing fans are a prime target audience for multimedia software) among other questionable business decisions. Soon he became paranoid and was convinced a larger company would soon rip him off, and create a competing version of HyperStudio. He decided to pre-empt that by selling the company – and quick! Roger did big show for Microsoft but they passed (despite at the time buying “anything”). But a conglomerate eventually bought it, allowing Roger to escape what he thought was “certain doom”. But the truth was the niche was too small for any of the “big players” to care about and a competitor never eventuated. With his millions(?) of dollars, he recreated his chemistry lab from his junior high-school teaching days. He also bought a rare book auction house and started jazz singing. Then he learned to fly a plane, got a pilot’s license, and had that license signed by Buzz Aldrin and Scott Carpenter. What else was there left to do in life? But luckily, in 2007 another company bought the rights to HyperStudio, and approached Roger to help create a new version designed for modern computers. The new company, Software MacKiev, wanted to make changes but Roger pushed back and he maintained creative control, keeping the spirit of the original program but with modern OS conventions and interoperability. But once again, Roger’s mind returned to hardware, and he wondered if he could control an Arduino (an interface between a computer and other physical electronic and electromechanical devices) with the revived HyperStudio. That way kids could create interactive physical presentations, such as a paper-mache volcano or a science-fair diorama. He created a series of instructions on how to do it using simple electronic components and a generic Arduino, but they were too complicated for K-12 teachers and so he built a “piggyback” board that makes the process much easier by providing for easy configuration at the expense of limited-use cases. Originally, the boards used light sensors to decide when users were “touching” them, but student projects were often presented in dark rooms and this became an obvious problem. Roger has since switched to touch sensors. Kids can simply select the desired input inside HyperStudio and link it to a card in the “stack”. Once activated the software goes to that card. Roger’s line of hardware Arduino boards has since expanded to a variety of boards that provide various functionality. He’s also working on a Chrome plugin that will allow users to use his boards to direct the browser to various URLs. Nox Archaist, an effort to develop an RPG utilising modern software development methods, demonstrated the game’s splash screen and explained how they optimised for space, added Mockingboard music and some other enhancements. A new Kickstarter is still in the works but no firm date yet.